Sri Lanka 6-294 (Kumar Sangakkara 127*, Dinesh Chandimal 102, Rubel Hossain 2-41) lead Bangladesh 240 (Mominul Haque 64, Nasir Hossain 48, Rangana Herath 5-68) by 54 runs with four wickets remaining. Kumar Sangakkara hammered his third consecutive century vs. Bangladesh and Dinseh Chandimal dispatched his second as Sri Lanka took command in the second Test. Bangladesh was bowled out for 240 runs in 83.3 overs in their first innings and Sri Lanka piled up 294 runs for the loss of six wickets in 93 overs. 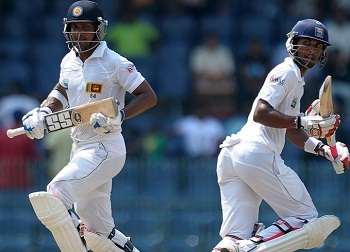 The second day’s play finished on Sunday, March 17, 2013, at R Premadasa Stadium, Colombo. Earlier, the Lankan Lions started the day at 18 after losing one wicket in four overs whereas Dimuth Karunaratne and Sangakkara were at the crease with 12 and 3 runs respectively. 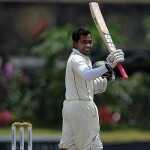 The latter hit 2 fours in the sixth over and the score was taken to 39 in nine overs when Karunaratne was gone for 17. The Bengal Tigers came back in the game as the hosts lost another couple of wickets as the total touched 69 in 22.5 overs. Dinesh Chandimal got together with the smooth going Sangakkara and lunch was taken after 27 overs at the score of 79 runs. The first hundred of the innings was attained in 35 overs and Sangakkara went past his fifty with a four. Chandimal scored just 16 runs off the first 51 balls with one four and opened his arms with 3 boundaries in the 41st over. The run rate was checked by the rival bowlers after that and the next ten overs produced 26 runs but most importantly without any further loss. Dinesh Chandimal reached his third successive fifty in two Tests on the first ball of the 56th over and the hundred of the partnership was also posted on board. Sangakkara kept on crawling from the other end and scored most of his runs by running but added 2 fours in the 67th and next over. Bangladesh bowlers were unable to penetrate and the batsmen did not take any risk as Kumar Sangakkara plundered his third back to back century in the ongoing series that was the 33rd of his Test career. Dinesh Chandimal kept on cruising from the other end and hit 2 more fours in the 75th over as the score reached the 250 runs mark in the 77th over. He smashed his sequent ton against the tourists on the second delivery of the 80th over as the Bangladeshi skipper, Mushfiqur Rahim took a new ball in the next over. The fifth wicket association resulted in 195 valuable runs and was lifted to 264 in 82.1 overs as Dinesh Chandimal was clean bowled by Rubel Hossain for 102 off 176 with 8 fours. Kumar Sangakkara held his end for 127 off 271 balls with 10 fours and Nuwan Kulasekara was playing at 2 as the Islanders scored 294 runs in 93 with four wickets in hand at stumps on day two. Robiul Islam and Rubel Hossain were the top wicket takers with two each whereas Sohag Gazi and Abul Hasan shared one wicket each. Sri Lanka has gained a first innings lead of 54 runs and with Kumar Sangakkara still in the center, the hosts can end up dictating terms against Bangladesh on day three.